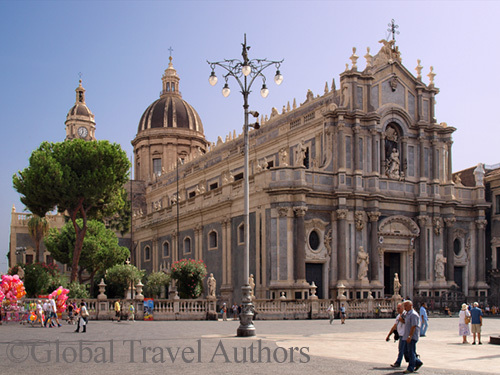 The third largest city of Sicily, a UNESCO-listed Catania lies in close proximity to the majestic mountain Etna. 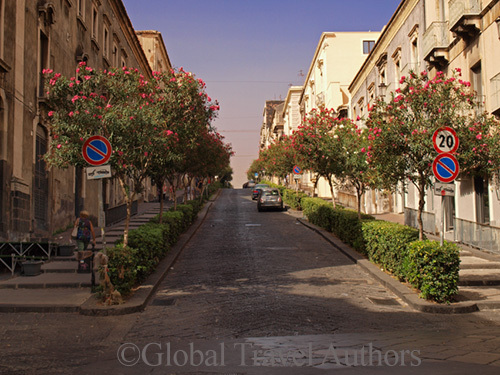 The city was always subject to the brooding moods of that volcano. 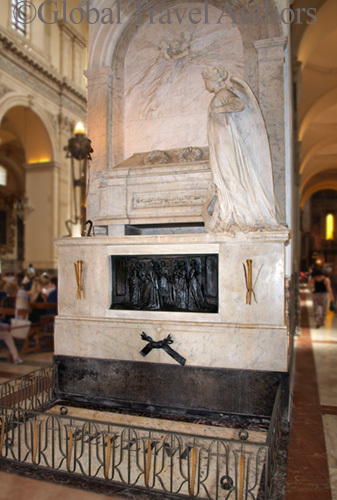 In the late 1600s, Mt. 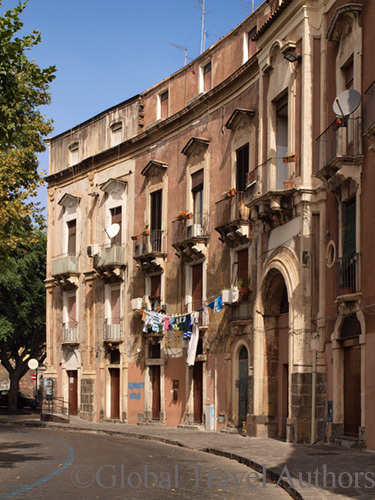 Etna struck twice: first drowning Catania and over 12,000 of its inhabitants in boiling lava, and then, in less than 25 years, leveling the city again by a murderous earthquake. Only 2,000 people survived. 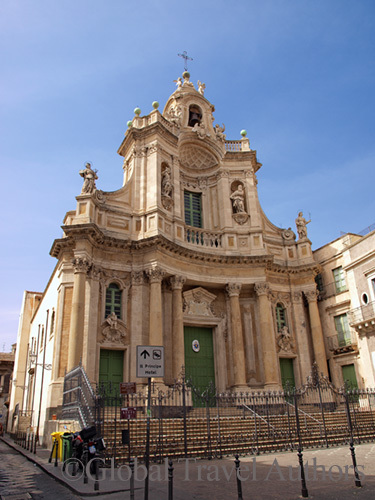 However, like phoenix out of ashes, Catania, rebuilt by architects from Rome, was reborn as one of the greatest baroque cities of the Mediterranean. 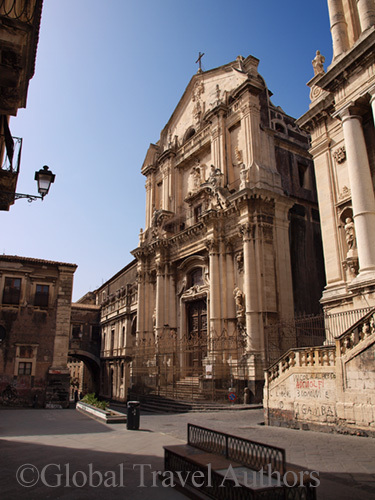 Today, many visitors skip Catania for the sake of Taormina or Siracusa and this is a sad mistake. 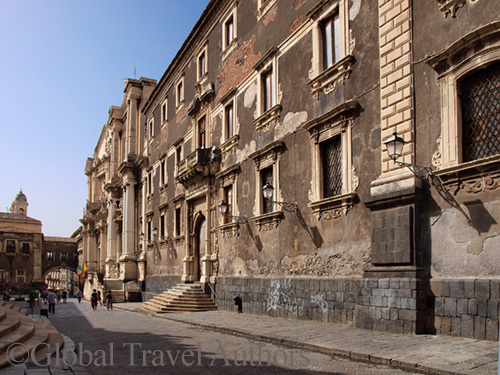 The city radiates a strange romantic beauty with its broad boulevards and spacious squares, grandiose palazzos, and great cathedrals, still striking in their black and white colors, lava and limestone, crumbling plaster, and cracked marble columns. 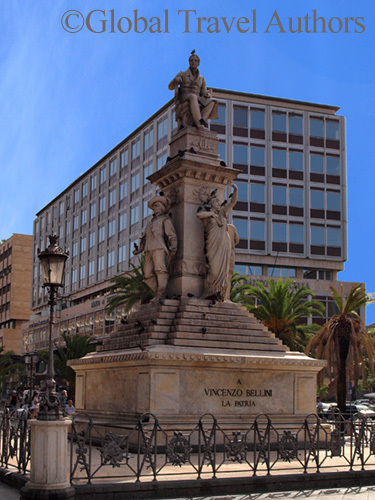 Renowned composer Vincenzo Bellini, born and bred in Catania, is buried in the city’s main cathedral, the Duomo. 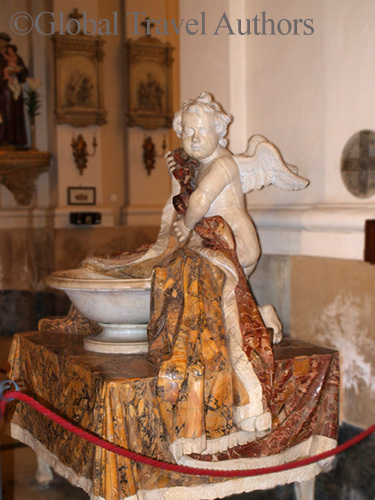 His presence is felt everywhere: monuments, a house-museum, and even in a beloved Sicilian dish-Pasta dela Norma is named after Bellini’s world-famous opera. 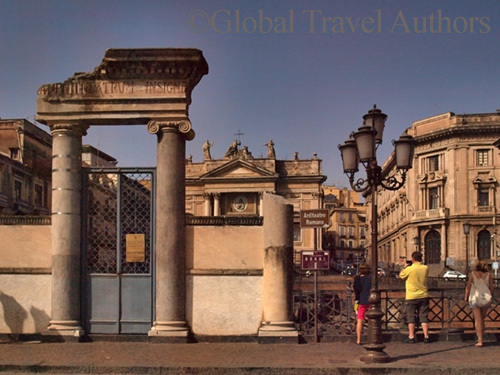 Founded by the Greeks in the 8th century BC, Catania became the most prosperous Sicilian city during the Roman age, and still boasts not one but two Roman amphitheaters: the smaller one, near Piazza St. Francesco d’Assisi, was built, as Romans often did, on top of a Greek theater, but the larger one, the largest in Sicily, was a Roman original, and could accommodate 16,000 spectators. 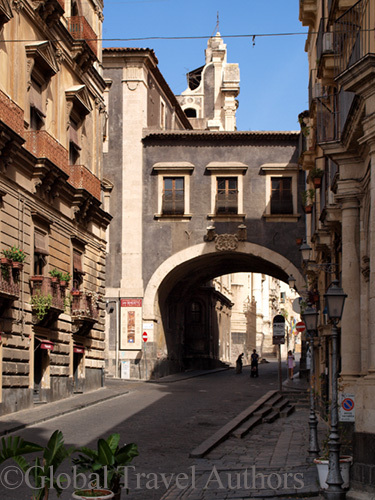 Now we can admire parts of that great structure near Piazza Stesicoro. 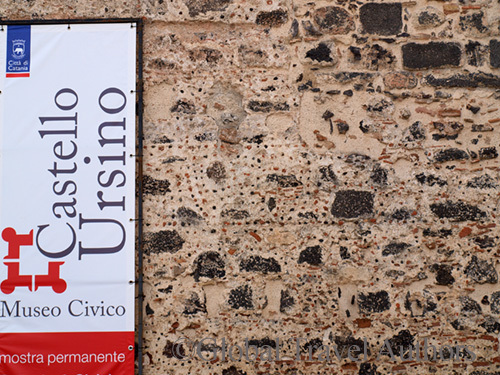 The majestic 13th-century Ursino Castello, built on the orders of Emperor Frederick II von Hohenstaufen, is the only city structure not destroyed by Etna. 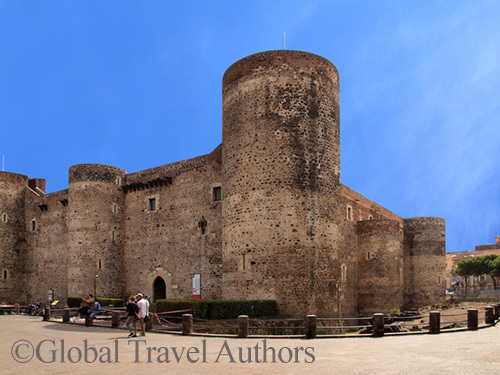 The castle was designed to be the city’s guardian, situated on the top of a seafront cliff, but the volcano changed the landscape and the Castello is now landlocked. 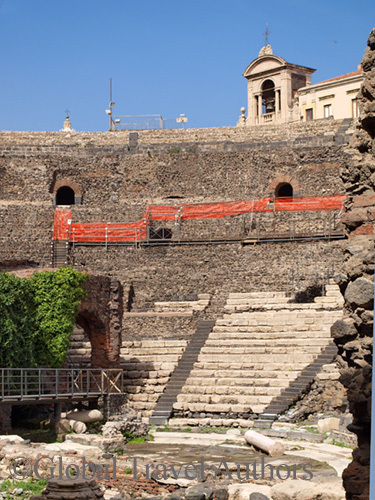 Inside the Castello is the city museum, Museo Civico, but the most interesting feature of the castle is outside: near the front gates, its massive wall displays a menorah laid out in small black lava stones like a mosaic. Perhaps the Jews working on the construction wanted to write their own page in the city’s history. 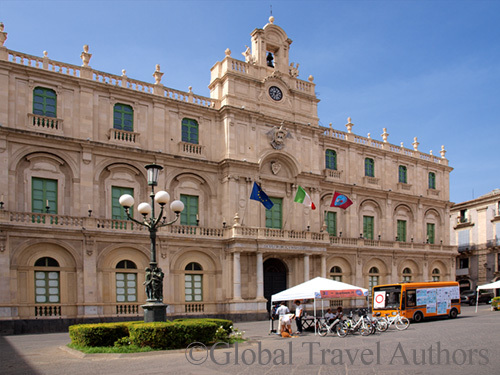 Catania’s main square with the Duomo in its center is a World Heritage site, and is dazzling in its majestically theatrical beauty. 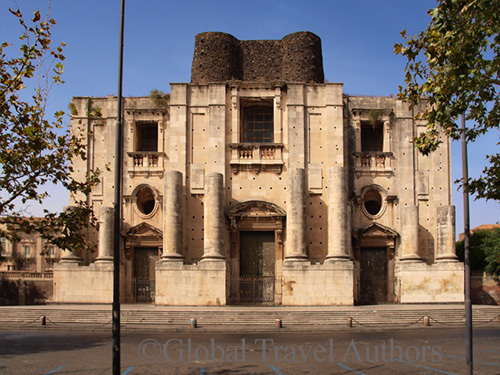 Here is Catania at its best, showcasing its black lava-while limestone baroque grandeur. 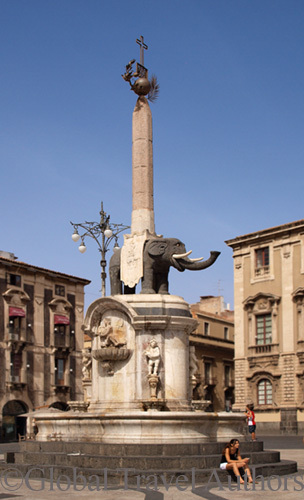 In front of the Duomo, is Fontana dell’Elephante, a funny black lava elephant that smiles at us while carrying a huge Egyptian obelisk on its back. 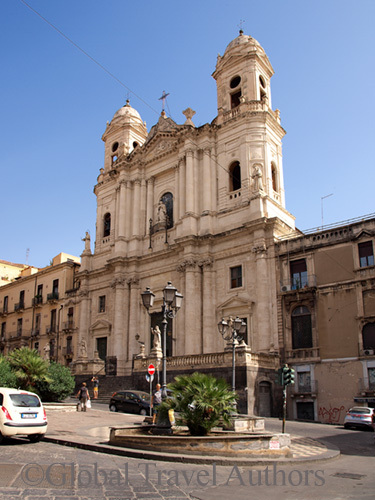 If you are willing, Catania, this special city, will unveil its treasures for you. 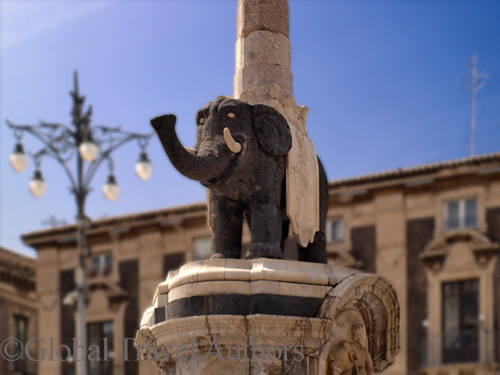 This entry was posted in Italy, Travel Photography, Travel Tips and tagged Catania, Italy, Sicily, tips, travel, vacation. Bookmark the permalink.